Rest, reset and energise your body with the worlds first 10 day Fermented Foods Detox program! Dr Elen’s Fermented Foods Detox (FFDetox) program uses traditionally prepared, bio-fermented Certified organic whole foods specifically combined to promote rapid yet gentle detoxification of metabolic waste products from the body and help reduce inflammation. Dr Elen is a leading General Practitioner with over twenty years of private clinical experience practicing integrative nutritional medicine. She combines her wide-ranging back ground in conventional medicine with scientifically founded complementary approaches to treat patients around Australia and Worldwide. The FFDetox is a culmination of Dr Elen’s experience resulting in a kit that helps increase your body’s ability to absorb and utilise the nutrients in your food. The Worlds first 10 Day fermented foods detox program! 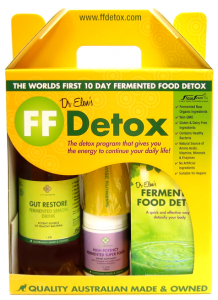 Dr Elen’s Fermented Foods Detox (FFDetox) combines the very best certified organic natural products with the culmination of years of medical, clinical experience. FFDetox is not a fad diet, it has been specifically designed based on researched scientific principles to rest, reset and energise the body. Using traditionally prepared, bio-fermented organic whole foods to detox and increase your body’s ability to utilise the nutrients in your food. The book is complete with recipes for additional meals, and even herbal teas, that complement the detoxification process. For important cautionary information click HERE. Click HERE to visit Pure Health Direct for more information or to buy now.